At Bodner & O'Rourke, we are dedicated to providing all of our clients with the highest quality service and support. To further our quality goal, we have put together a list of frequently asked questions. We hope you will find our answers beneficial. How do I know if I need patent, trademark and/or copyright protection? What is the patent application? What happens during the patent application process? What types of trademarks are there? How are trademark rights acquired? What are the advantages of a federal registration? What is the trademark application process? How long do trademark registrations last? What is the difference between ® and “tm”? How should I use my trademark? Who is entitled to a copyright? What are the advantages of a copyright registration? How do you obtain a copyright registration? What is the fair-use defense to copyright infringement? How do I transfer rights to a copyright? Q: How do I know if I need patent, trademark and/or copyright protection? A: Patents protect inventions and improvements to existing inventions. Copyrights cover literary, artistic, and musical works. Trademarks are brand names and/or designs which are applied to products or used in connection with services. Q: WHAT IS A PATENT? A: Patents are grants by the United States Government for a term of twenty years from the filing date of the application. A patent gives its owner the right to exclude others from making, selling or using the claimed invention. Patents can be obtained for any new and useful process, machine, article of manufacture, or composition of matter, e.g., a new drug, a computer program, a method of doing business, a process for making a product or a machine used by the process in making the product can all be the subject of a patent. In addition, one can obtain design patents which are for any new, original, ornamental design. The term of design patents is 14 years from the date of issuance. Q: WHAT IS A PATENT SEARCH? A: In order to obtain a patent, an application must be filed with the United States Patent and Trademark Office. However, before an application is filed, it is recommended that a patent search be performed to see if the invention is patentable. 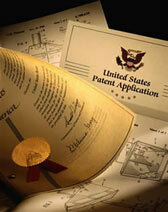 The United States Patent & Trademark Office makes its patents available on its website, www.uspto.gov. It is easier to search for patents that issued since 1976 on the Patent Office’s website. If you have a search done there may still be prior art that will not be uncovered by the search. For example, because many patent applications pending in the Patent Office are kept secret by the Patent Office, until the patent issues it is always possible there is a patent application on a similar invention that you may not be aware of when the patent search is performed. In addition, there may be prior publications that could preclude the issuance of a patent. Prior publications describing the invention are not usually searched unless it is specifically requested and these searches can significantly increase the cost. Q: WHAT IS THE PATENT APPLICATION? A: Once the search has been completed and the decision is made to file a patent application, the application must be prepared. The application must contain a written description that fully describes the invention. In addition, the inventor must disclose the best mode of the invention that the inventor is aware of at the time the application is filed. This “best mode” requirement means that if the inventor knows of a particular ingredient or step or feature that makes the invention work better, this information must be disclosed in the application. If such information is withheld, the patent will be invalid. For many inventions, the application will also include drawings that are used to fully describe the invention. The written description of the invention ends in one or more claims that set forth what it is that the inventor claims is his invention. The claims are the metes and bounds of the patent. When a competitor uses the invention, it is the claims that determine whether there is infringement. Q: WHAT IS A PROVISIONAL PATENT APPLICATION? A:In some instances, because of, for example, time constraints, costs or other reasons, a decision is made not to file the usual patent application. In such cases, a provisional application may be filed instead. These are frequently filed where the inventor is giving a speech or other type of presentation, where the invention will be revealed and the inventor is desirous of protecting the invention but there is insufficient time to file the normal patent application. In such instances a provisional application may be filed. The provisional application must have a written description of the invention. The Patent Office fee, however, for a provisional application is only $200 for a large entity and $100 for a small entity. The provisional application merely postpones the time for filing a patent application one year. The complete patent application must be filed within one year of the filing of the provisional application. Q: WHO IS THE INVENTOR? A: The patent application must be filed in the name of the true inventor. An inventor is any one who contributes to the subject matter of one or more of the claims of the application. In many instances more than one person is an inventor. A person may be named as an inventor even if he or she did not work on the invention at the same time as the other inventor or inventors. Similarly, the fact that one person’s contribution is less than the others does not preclude him or her from being named as an inventor. Either at the time the application is filed or subsequently during the period allowed by the Patent Office, an oath or declaration of the inventor must be filed. The oath or declaration includes a statement that the person signing is the “original and sole inventor of the subject matter which is claimed”, that the application has been reviewed and understood and that there be an acknowledgment of “the duty to disclose all information which is material” to the prosecution of the application, i.e. prior art that the inventor is aware of. Q: WHAT HAPPENS DURING THE PATENT APPLICATION PROCESS? A: After the application is filed it will be processed by the United States Patent and Trademark Office. It usually takes many months before the application is first reviewed by the Examiner. The Examiner will perform his own search and either allow or reject the claims. The claims can be rejected for a number of reasons such as, the subject matter claimed is not new or is obvious in view of the prior art, the claims are not as clear as the Examiner would like, etc. The applicant is usually given three months to respond to the Office Action from the Examiner. If the Examiner continues to reject the claims in a second Office Action the applicant can respond to the second Office Action as well as file a Notice of Appeal. Once the application is allowed there is a Patent Office Issue Fee that is to be paid and the application issues as a patent. Q: WHAT IS PATENT INFRINGEMENT? A: If the patent is ever infringed, the owner of the patent may bring an action for patent infringement. If infringement is proven the patent owner is entitled to damages for the infringement. The monetary damages the patent owner can receive may include his lost sales and lost profits due to price erosion. In no event can the amount of damages be less than a reasonable royalty. If the infringement is willful the amount of damages can be doubled or even trebled. In addition to monetary relief the Court can also award an injunction preventing the infringer from selling the infringing product. Q :WHAT IS A TRADEMARK? A: Businesses endeavor to build consumer loyalty in the goods or services they offer. When such efforts succeed, the resultant consumer goodwill generates repeat business and referrals. Trademarks are “brand names”, and the law relating to trademarks largely pertains to guarding commercial reputations. Trademarks (or brand names) are commercial indicators of source and they distinguish one company's goods from another's. They may be words, logos or other symbols that tell consumers that goods come from, or are sponsored by, a particular company. Trademarks also include sounds, three-dimensional symbols, such as the "golden arches", colors -- or even scents! Q: WHAT TYPES OF TRADEMARKS ARE THERE? A: Trademarks may be classified as (i) fanciful  a coined word, e.g. “Kodak”, (ii) arbitrary  words in common use but not suggestive of the product or a characteristic of the product e.g. “Polo” for shirts, (iii) descriptive  marks that are inherently not distinctive, being descriptive of the product, function, or intended use e.g. “PM” for sleep aid, and (iv) generic  incapable of acting as a trademark e.g. escalator. A trademark may become generic due to improper use. Fanciful trademarks are the strongest trademarks. Whatever their type, trademarks allow consumers to seek (or avoid) particular sources of products. Once a mark is selected a search is usually performed to see if it is available. While the U.S. Patent and Trademark Office website has all of the registered trademarks available for search, the website does not provide any information on unregistered uses which can be significant. As a result prior to investing in a trademark many companies have their attorney order a trademark report from a commercial database that provides a more complete search. Q: HOW ARE TRADEMARK RIGHTS ACQUIRED? By actually using the mark in commerce on a product or in association with a service. intent to use the mark in commerce. The filing date of an intent to use application with the USPTO to register a trademark or service mark establishes a date of constructive use of the mark. The act of filing the application, therefore, can create a nationwide priority of rights in the mark against any other person who subsequently adopts the same or a confusingly similar mark. This priority of rights is contingent upon the mark ultimately issuing as a federal registration. The intent to use the mark must be bona fide or the application may be invalid and the applicant may be subject to certain penalties for filing a fraudulent claim of intent. The federal registration will be issued only after the applicant has made actual use of the mark on the goods or in association with the service that it claims to have intent to use when the filing takes place. Actual use of the mark must be made within six months of the time that the Trademark Office issues a notice of allowance of the mark after the application has been filed, although that period may be extended in appropriate circumstances. When actual use is made and the federal registration issues, the owner's rights in the mark are superior to all who have adopted the same or a similar mark for the same or a similar product or service subsequent to the filing date of the owner's application. Q: WHAT ARE THE ADVANTAGES OF A FEDERAL REGISTRATION? Q: WHAT IS THE TRADEMARK APPLICATION PROCESS? A: An application for a federal registration of a trademark or service mark filed in the USPTO is examined by the Examiner to ensure that the mark is not likely, when used on or in connection with the goods or services of the applicant, to cause confusion, or mistake, or to deceive the consuming public with other registered trademarks. The Examiner also determines whether the mark is incapable of performing the identification function of a mark because, for example, it is the generic word for the product or service with which it is used or because it is descriptive of the products or service with which it is used. The Examiner may ask for clarifications or amendments to the application before the application is finally allowed. The process of trademark prosecution may take up to a year or more to complete. One common ground for rejecting a trademark application is that the word is too descriptive of the goods to which it is applied. Such a mark is not permitted to be registered because it removes the word from general use. Q: HOW LONG DO TRADEMARK REGISTRATIONS LAST? A: Federal trademark registrations are valid for ten years and can be renewed for like periods, provided the mark continues to be used. Failure to use a mark in commerce can cause the rights in the mark to be lost, the rationale being that prolonged non-use causes the mark to lose its significance to the public as an identification of a single source and a standard of quality. This is known as abandonment of the mark. During the fifth year of a registration and before the beginning of the sixth year a statement of use must be filed to continue the registration in force. Q: WHAT IS THE DIFFERENCE BETWEEN ® AND “TM”? A: The use of the registration symbol ® with a mark indicates that it is federally registered. The symbol “TM” is often used with unregistered trademarks to give notice to the public that the user is staking out a claim in the symbol as a trademark, but such use is optional. The symbol “SM” may similarly be used to designate an unregistered service mark. A: WHAT IS TRADEMARK INFRINGEMENT? registered, or a bona fide intent to use application has been filed in the USPTO before using a mark. A trademark search is one method of making reasonably certain of the propriety of using the mark. However, it must be remembered that a search may be insufficient. A search may not locate all prior users who have confined themselves to a fairly small geographic area and thus have obtained common law rights in those area for the mark being used. Q: HOW SHOULD I USE MY TRADEMARK? A: A trademark needs policing. Unchecked infringing activity or use of the trademark itself as a descriptive word may cause the trademark to lose significance in the market place as a source indicator and thus lose value as a trademark. A trademark should be used only as an adjective, never as a noun. In addition, the marketplace should be kept free of confusingly similar trademarks. A: WHO IS ENTITLED TO A COPYRIGHT? A: Copyrights are statutory property rights, which grant to authors or creators certain exclusive rights in their creations for a limited duration. Copyright law protects intangible original works of authorship which are fixed in a tangible medium of expression. In other words, copyright protects the expression of ideas, but not the ideas themselves. Copyright protects such works as books, pictures, graphic and sculptural works, music, photographs, movies and computer programs. In order to receive copyright protection, the work must be original, i.e., independently created and not copied from other works. The requisite originality is minimal - any distinguishable variation of a prior work, if the variation is the product of the author’s independent efforts a copyright will be available. A copyright gives the author a number of exclusive rights. These rights include the right: (1) to reproduce the copyrighted work; (2) to make derivative works (e.g. a movie from a play); (3) to distribute copyrighted works to the public; (4) to perform, publicly, certain works (e.g. music); and, (5) to display, publicly, certain works (e.g. works of art). A copyright arises upon fixation of the work and, under current law, endures for the life of the author plus 50 years. Publication is not a prerequisite for copyright protection - it applies to both unpublished and published works. Q: WHAT ARE THE ADVANTAGES OF A COPYRIGHT REGISTRATION? If registration is made within 3 months after publication of the work or before an infringement of the work, statutory damages and attorney's fees will be available to the copyright owner in court actions. Otherwise, only an award of actual damages and profits is available to the copyright owner. Copyright registration allows the owner of the copyright to record the registration with the U.S. Customs Service for protection against the importation of infringing copies of the registered work. Q: HOW DO YOU OBTAIN A COPYRIGHT REGISTRATION? The familiar copyright notice is no longer required on copies of works published after March 1, 1989. However, it is still in the copyright owner's interest - to facilitate a suit for damages - to place a copyright notice on the published work. The notice should include the copyright symbol © or the word "Copyright" or its abbreviation (Copr. ), followed by the year of first publication of the work and the name of the copyright owner. A: Copyright ownership vests in author of the work. In the case of joint authors, they are joint owners. Work made for hire is generally owned by the employer. (Work made for hire is defined as that which is prepared by an employee, work specially commissioned, or parties agree in writing it is a work made for hire). Ownership of a copy of the work does not confer on the owner of the copy the same rights the owner of the copyright has. For example, ownership of a video tape of a movie permits you to view the movie at home but does not give you the right to make copies or to show the movie to others for a fee. Q: WHAT IS COPYRIGHT INFRINGEMENT? A: A work does not have to be identical to infringe a copyrighted work. The legal test of infringement is "substantial similarity" -- which roughly amounts to whether an ordinary observer would recognize a work as having been copied in whole or in part from an earlier one. Independent creation is permitted. A second work, identical to an earlier copyrighted work, does not infringe, if it is, in fact, independently created. copying by the defendant, i.e., use of plaintiff’s material as a model, template or inspiration. Similarities that would not be expected to arise independently in two works would be looked at closely by the Court or jury. Copying can be proven by proof of defendant’s access to the copyrighted work and substantial similarity. As stated above, independent creation is a defense except where the similarity between the two works is such that no explanation other than copying is reasonably possible. The remedies available to the owner of a copyrighted work are action in a Federal Court, injunction, impounding and destruction of infringing copies, and damages (which may be actual damages and any additional profits of infringer, as well as statutory damages). Willful infringement would attract statutory damages up to $100,000. In addition, reasonable attorney’s fees may be granted to the prevailing party. Apart from these remedies, criminal penalties are also available. There is no liability for actual or statutory damages before receipt of actual notice in case of innocent infringement. However, if the defendant has copies of the copyrighted work with notice, there is no defense of innocent infringement. Q: WHAT IS THE FAIR-USE DEFENSE TO COPYRIGHT INFRINGEMENT? In considering the defense of fair use, courts look to the purpose of the use i.e. whether the use is commercial or non-profit educational use, the nature of the copyrighted work (the more creative the work the more protection it will be entitled to), the amount and substantiality of the portion used, and the effect of use on the market for the copyrighted work. Q: HOW DO I TRANSFER RIGHTS TO A COPYRIGHT? A: Any or all of the exclusive rights or any subdivision of those rights, of the copyright owner may be transferred. Transfers of copyright are normally made by contract and, indeed, the transfer of exclusive rights is not valid unless that transfer is in writing and signed either by the owner of the rights conveyed or such owner's authorized agent. Transfer of a right on a nonexclusive basis does not require a written agreement. The law does provide for the recordation in the Copyright Office of transfers of copyright ownership and although recordation is not required to effect a valid transfer between the parties, it provides certain legal advantages and may be required to validate the transfer as against third parties.